Recipes That We Have Tried! without a hitch. Now we start our week with Main Dish Monday and boys will be boys, he needs to rock Danny's world. So after congratulating him on a job well done for last week, now its game on to show off the skills this boy has. I would tell Steve get in the kitchen and roll up his sleeves, but it's Hawaii who wears long sleeves, yeah I know. So Commander your task, take barbecued ribs, make them juicy, put a Hawaiian twist on it and serve them up for your friends to enjoy. Question is do you take me up on my challenge, or are you looking to go a couple of rounds in the ring instead? best part about the preparation, a slow heat in the oven gets you started with a basic recipe, then use any sauce you like to finish on the grill, or even under the broiler. 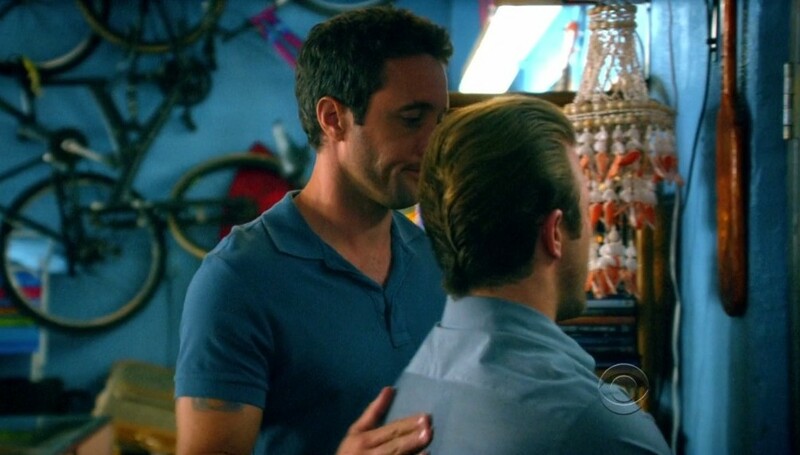 Today McGarrett wants to go native Hawaiian (can't imagine why) but feel free to use any sauce you like. Once these babies start to cook chill out for a while, take a swim, you have time to kill. In a roasting pan place ribs sprinkle with salt and pepper, and lightly sprinkle with Liquid Smoke . Cover tightly with foil; bake for 2 1/2 hours. While ribs are cooking in a small saucepan, combine pineapple juice, teriyaki sauce, ketchup, garlic, and brown sugar. Bring to a boil, stirring , over medium-high heat. Reduce heat to low; simmer for 10 minutes. Stir in ginger. Remove from heat; let cool. When ribs are finished remove from oven and pan, and keep covered. Heat grill to medium. Brush with half of sauce, heat, covered, watch closely as not to burn, turning in about 5 minutes or when grill marks appear. Brush with remaining sauce. Grill, covered, until browned, about another 5 minutes per side. During last 2 minutes, place pineapple on grill. Grill about 1 minute per side. * The Liquid Smoke is optional, and a little goes a long way, but a light sprinkle will add that outdoor smokiness to this indoor cooking method. Also if you are able to find you may substitute Hawaiian Pink Salt for plain salt in this dish but it is not necessary. *If using a basic barbecue sauce, you may use the salt and pepper to season ribs, or mix it up and use a rub. Apologies to our friends …. This was a journey that started on a Sunday night Twitter chat back in January 2012 with a picture of Alex O’Loughlin and an innocent comment, the photo was dubbed “a little AOL on the rocks". Knowing my love for cooking my friends challenged me to develop a drink recipe, yet there were some stipulations. Ingredients must start with the letters A, O, L and have a hint of the tropics. This lead to a drink so aptly named AOL on the rocks (just keep it simple). I was further challenged to see if I could keep the inspiration alive, and the birth of a blog began. This blog has taken my love of cooking, while intertwining my love for a television show and challenging my imagination. The recipes, some are family favorites that are revamped, given a new life and story. Some of my family’s favorite recipes that just needed to be shared with others, now have found a new story to tell with some familiar characters. During this journey I have found ways to pair recipes with the characters, without leaving Long Island. As I grow I find this journey has me trying new venues, new styles, exploring all that this journey has to offer. Since I have not only explored new culinary techniques, but traveled to Hawaii and met some amazing people. My love of cooking was inspired by a very special woman, my grandmother Grace (Gracie). A woman who showed me that being in the kitchen was always a fun place. It was just a part of your soul and lived in your heart to be shared with others. That is what I try to do here. Something I have to say recently I understand the joy she found sharing her love with me, I now find the same pleasure here. This journey has let me realize how blessed I am, and how many special people have come into my life during this trip. Ralph Waldo Emerson said "Life is a journey, not a destination." This is one journey I am truly enjoying.